[Apple MFi-Certified]: Using Apple's original C48 terminal and smart chip, this MFi-certified cable is compatible with the following lightning devices: iPhone XS XS Max X XR 8 Plus 8 7 Plus 7 6s Plus 6s 6 Plus 6 5s 5c 5 iPad iPod as well as the latest iOS system. 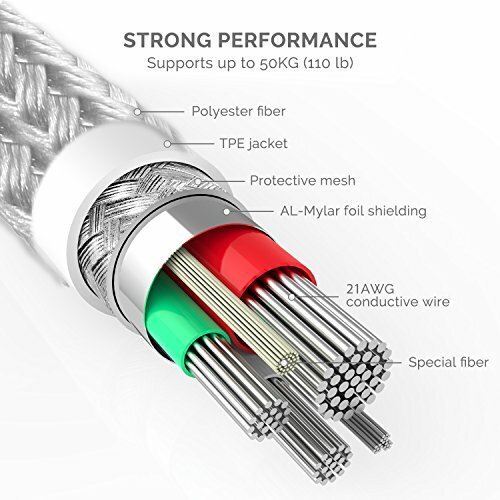 [Strong Nylon-braided Cable]: Exceptional tensile strength is provided by a high-performance, ultra-strong aramid fiber core, which is wrapped in a double-braided nylon sheath, resulting in a supple yet robust cable with superior toughness. The cable is able to withstand loads up to 50kg and has been tested to bend 95-degrees more than 8,000 times. 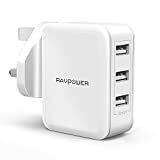 [Safer and Faster Charging]: Built with an original Apple chip, this product supports ultra-fast charging (2.4A current), which can be 20% faster than cables without the original Apple chip. 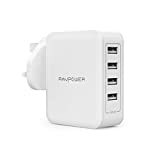 In addition, the cable comes with surge protection and other advanced safety features to keep you and your devices safe. Only use certified chargers that have passed a series of strict compliance tests to ensure that you and your devices are safe. [Perfect Length]: With a 6.6ft-long cord, you can lie on the couch and use your devices while charging them at the same time. The ultra-long cable offers the extra freedom to charge your devices in your bedroom, office and even in the backseat of your car. [Hassle-free service]: This product comes with a 36-month warranty and we offer friendly, easy-to-reach customer service at no additional cost. We are always here for you.